In addition to the out-of-the-box reports in the Reports tab and custom dashboards and analytics through Insights, qTest Manager allows users to export reports from Requirements and Test Design. In Requirements, select the Export Requirements icon on the toolbar and select Requirement Details report. Select which Requirement Fields you want to be exported by dragging and dropping them from the left to the right selection box OR by selecting a Requirement Field and then selecting the right-pointing arrow icon. Reorder the display of the Requirement Fields by selecting the Requirement Fields and then using the Move Up and Move Down arrows on the right-hand side of the dialog. Select the format for the exported requirements file as HTML or XLS. If you select the XLS format, you can choose to Merge requirements into one sheet. Otherwise, each module will be exported as a separate sheet containing its requirements. HINT: Select Reset to have default requirement fields list for export. Select OK to proceed or Cancel to cancel. The selected modules must have the same level on the requirement tree (e.g., the same level of parent modules or child modules in the same module, etc.). The Export Requirement function will be disabled if you select modules from different levels (e.g., a parent module and some child modules of another parent module). You can only select individual requirements of one module to export. Select Root to export all available requirements in the project. In Requirements, select the appropriate Test Case. Select the Export Requirements Report icon. Select Requirements Traceability Matrix Report. The selected modules must have the same level on the requirement tree, (e.g., the same level of parent modules or child modules in the same module, etc.). The Export Requirement function will be disabled if you select modules from different levels (e.g., a parent module and some child modules of another parent module). In Requirements, select the appropriate Module. Select the Export Requirements Report icon in the Navigation Panel. Select Requirements and Test Execution Report. The exported Matrix will contain two sections: Requirements and their Associated Test Cases & Test Runs. Number of Linked Test Runs. Associated Test Cases & Test Runs Section: includes Associated Test Cases, Associated Test Runs, Test Environment of individual Associated Test Runs, Test Log number, Testers of individual Associated Test Runs, Executed Start/End Time of individual Associated Test Runs, Test Runs Result Status, and Associated Defects. You can export Test Cases into Excel. To export Test Cases, you need Export Test Cases permission. Select one or multiple Test Cases or Modules to export. Click the Export Test Case Reports icon and select Test Case Detail report. 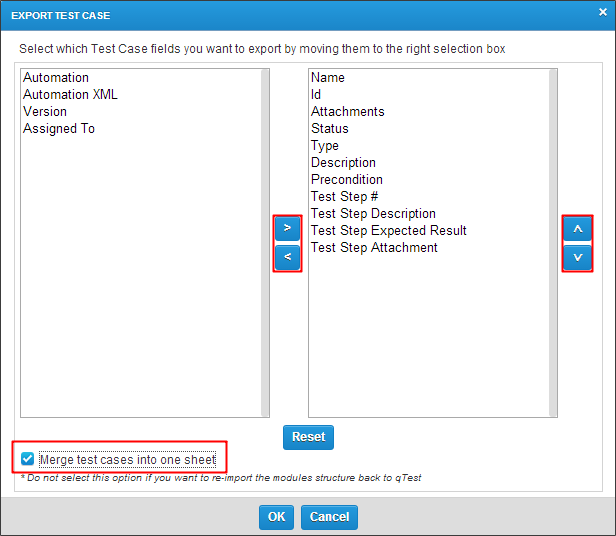 Select which Test Case Fields you want to export by dragging and dropping them from the left to the right selection box OR by selecting a Test Case Field and then selecting the right-pointing arrow icon. Reorder test case fields to be displayed in the Excel file using the Up and Down arrows. Merge all test cases from a different module into ONE Excel sheet. Check this box if you select multiple modules and want to combine all test cases into ONE Excel sheet. Test Case order on the test design tree will be kept intact in the exported Excel file. Note: By default, this option will be unchecked. When you select multiple modules to export, each module will be exported as a separate sheet of an Excel file. The Test Case Traceability Matrix shows the coverage of test cases with their requirements. In Test Design, select one or multiple Test Cases or Modules to export. Click the Export Test Case Reports icon and select the Test Case Traceability Matrix report. Select location on your computer to save the exported Test Case Traceability Matrix. Only test cases or modules on the same level can be exported. The Export option will be greyed out if you select test cases or modules on different levels. You cannot select a mix of test cases and modules to export.